I have a lot of cool tote bags but sometime they're too small to be of much use. 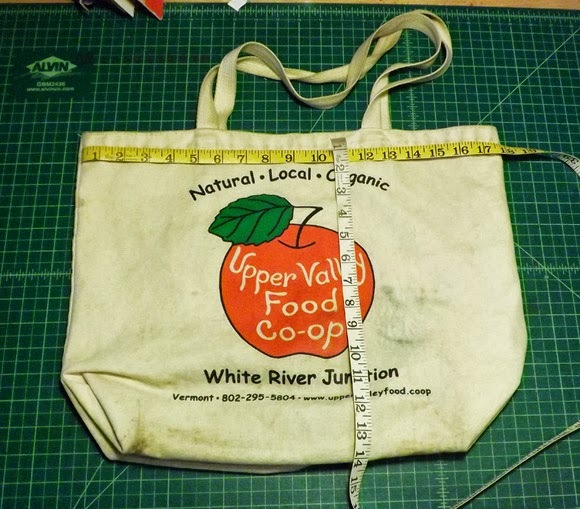 Here's how to turn two small bags into one big bag that you can fit lots of things in it. 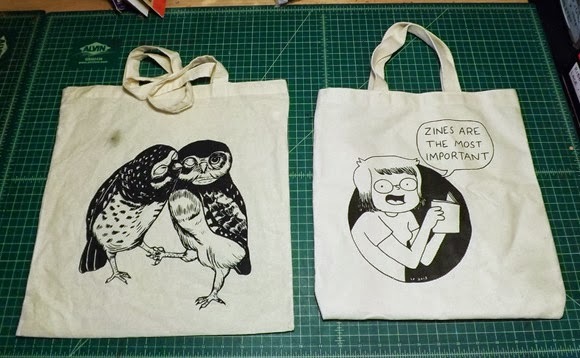 I took this great Nicole Georges owl bag and this awesome Liz Prince zine bag and created one big super zinester bag. 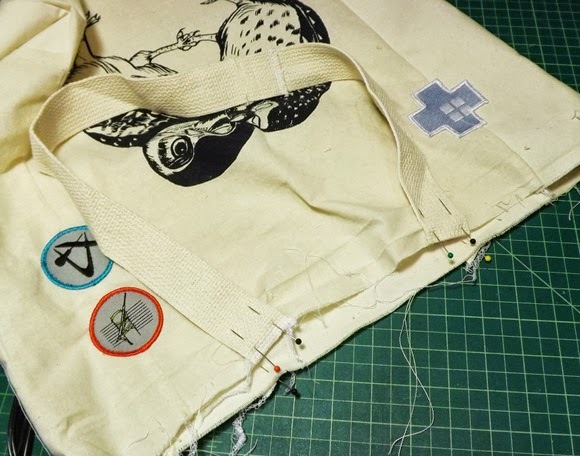 Use a seam ripper to take apart all the seams and stitches on the bags, take off the straps too. 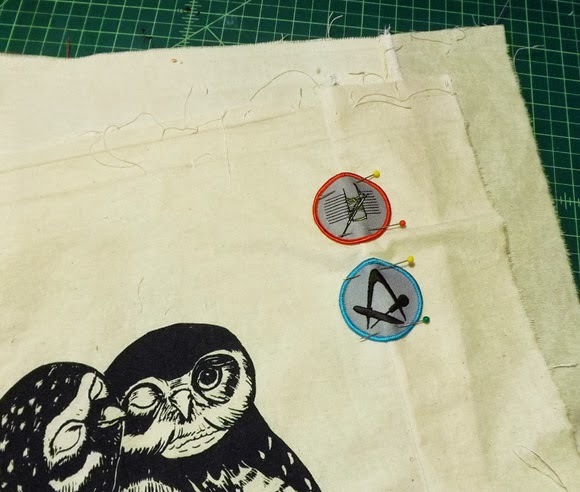 Once the bags are taken apart, lay them out and iron flat the old seams. 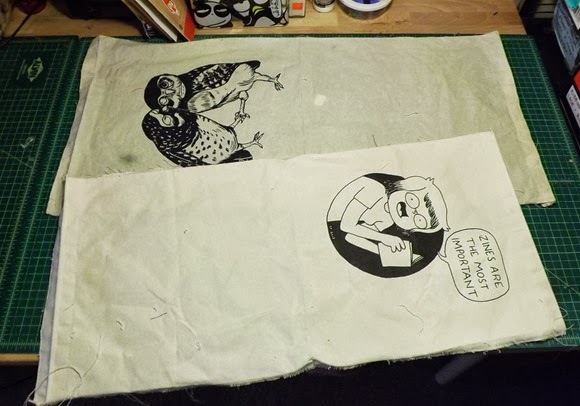 Once the finished bag size is decided, cut each picture panel to be the depth of one side plus seam allowance. My bag side was 17 1/2 inches plus 1/2 inch seam allowance on the bottom seam and 1 1/2 inches for the top hem, making the total to cut out 19 inches. 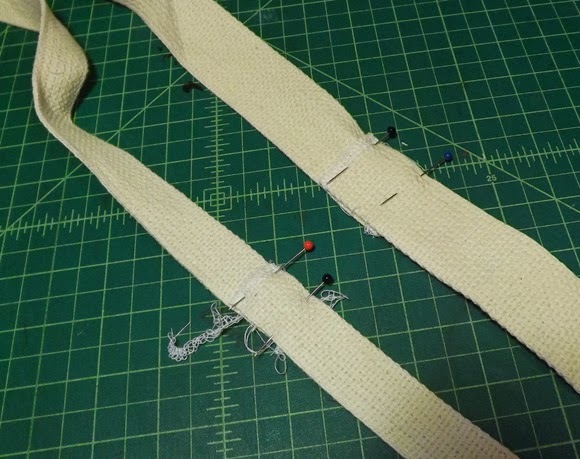 Save the extra fabric that you cut off. After the two picture panels are cut out, pin them together. If one of the panels is a slightly different size, trim it down so that they match. Sew the two main panels together at the bottom. 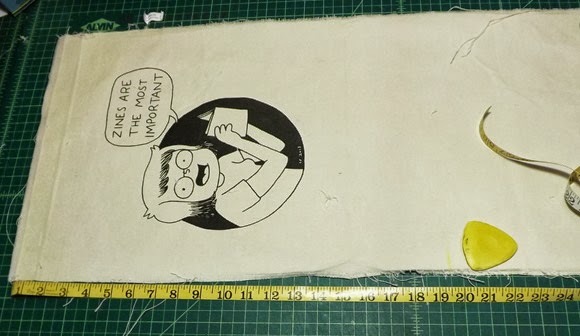 The panels alone weren't enough to make the width I wanted, 18 inches, so I added a strip to each side of the main picture panel. I finished my seams with a serger, but you could just as easily pink the edges or use a zigzag stitch. After the side panels are sewn to the main picture panels feel free to add embellishment. 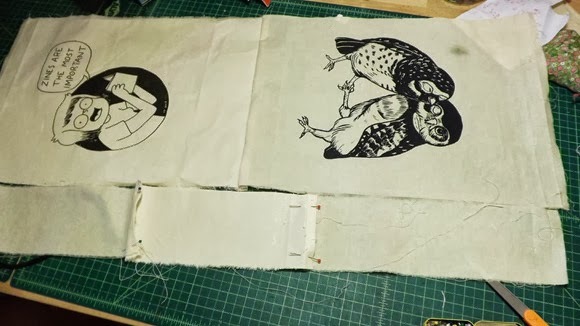 I sewed on some merit badge patches I had, including some awesome zine themed ones made by Jennie Hinchcliff and Carolee Gilligan Wheeler. 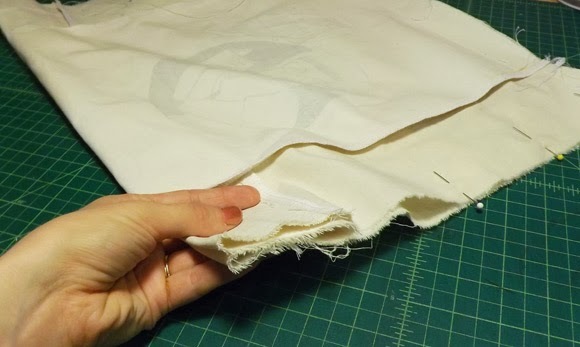 Fold the panel in half at the bottom to create the bag shape, then pin the top half of the side seams together. 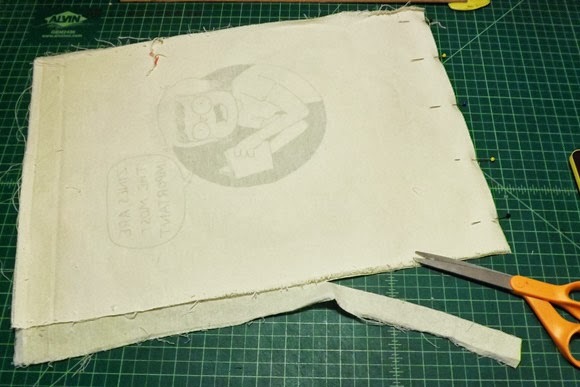 To make the base of the bag create a tuck in the fabric. 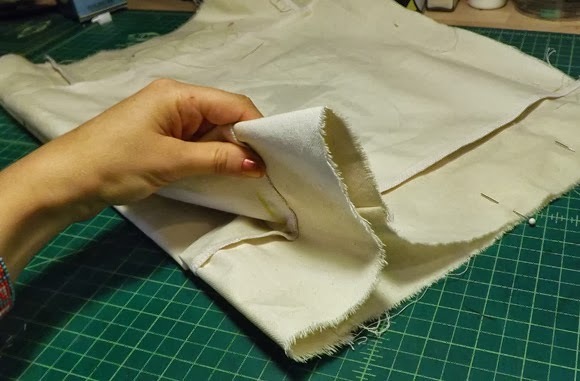 Flatten the tuck into the side seam, you'll sew over all of this and it will create the bottom of the bag. Finishing pinning with the tuck in the seam, then sew up the side seam. The straps on the little bags were also too small so I sewed two straps together to make one long one. I happened to have some strap material left over from another bag project so I used that to make the second strap. They aren't the same width but close enough for me. 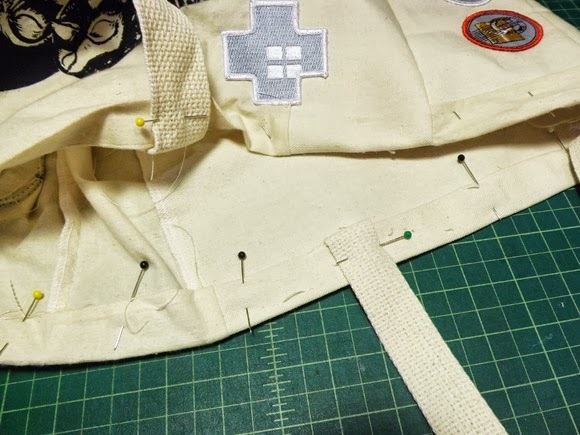 Pin the straps to the sides of the bag. Sew them on at 1/2 inch. 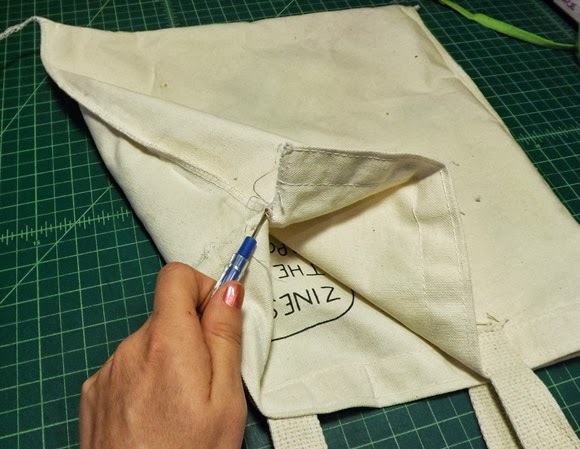 Fold over the top of the bag to create the hem. I kept the 1 inch hem from the small bag so I turned over 1 1/2 inch, folding in the 1/2 inch and sewing at 1 inch. Turn right side out and your bag is complete. The finished bag now can hold so much more so I'll actually use it on a regular basis. 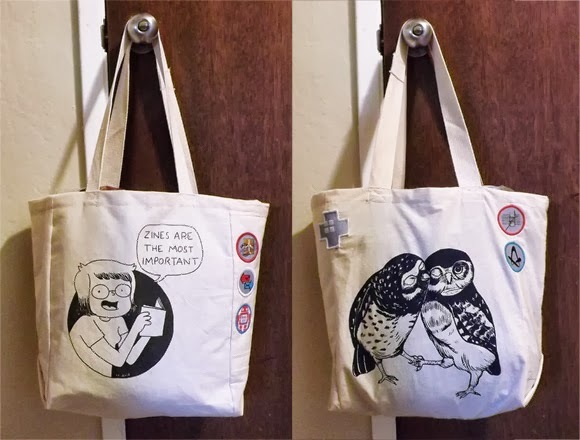 Now I can show off two great prints by two great ladies all on one bag.